The IBA Board is made up of eminent Indigenous and non-Indigenous members with expertise in business. The majority of the Board including the Chair are Indigenous. Board members are appointed by the Minister under section 157 of the Aboriginal and Torres Strait Islander Act 2005 (Cth). Appointed Chair of the Board, 1 December 2014. Eddie Fry is a Dagoman-Wardaman man from the Katherine region in the Northern Territory. 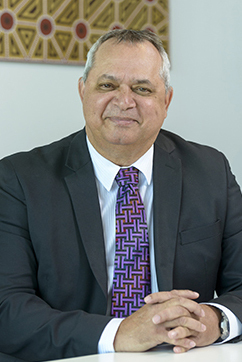 He has extensive experience within the Australian resource sector and is a specialist in Indigenous and native title issues. He holds a Diploma in Business Management from the University of South Australia and is a graduate of the International Lead and Zinc Study Group. Based in Adelaide, Eddie is a former director and a retained consultant of TNG Ltd, an Australian resource company focused on the exploration, evaluation and development of a multicommodity resource portfolio in the Northern Territory and Western Australia. He is a member of the development team for the TNG Ltd Mount Peake project. Eddie is an executive director of Gimbulki Ltd, a native title land access company he established in 2002, Chair of the Indigenous Advisory Board at Broadspectrum (since 2010), Deputy Chair of the Aboriginal Foundation of South Australia Inc., Chair of Todd River Resources Limited, and Chair of the Indigenous Land and Sea Corporation. Eddie held senior executive roles with Normandy Mining Ltd, where he established the company’s Traditional Owner policy. He was also involved with the Aboriginal and Torres Strait Islander Commission, Aboriginal Development Commission and Department of Aviation. Eddie is a member of the Remuneration and Nomination Committee. Reappointed Deputy Chair, 11 April 2017. Anthony Ashby is a Gamilaraay-Yuwaalaraay man from north-western New South Wales. He is a Chartered Accountant and Registered Company Auditor. He holds a Bachelor of Commerce from the University of New South Wales and a Certificate of Public Practice from Chartered Accountants Australia and New Zealand. Anthony’s other current board roles include a directorship of the Hunter New England Central Coast Primary Health Network Ltd. Anthony is also an ex-officio member of the Supply Nation Audit and Risk Committee. Anthony and his wife Vanessa have operated their own public accounting practice since 2004, providing a mix of taxation, assurance, accounting and consultancy services to their client base. Anthony is Chair of the Finance, Investment and Products Committee and a member of the Remuneration and Nomination Committee. Claire Woodley’s diverse background includes experience in the banking sector, as well as clinical and managerial experience in the delivery of public mental health services. She has a passion for driving equal access to opportunity across the community, with a specific interest in providing opportunities for enablement for Indigenous people. Claire brings to the Board her broad business banking experience and her corporate experience in governance, risk management, strategic planning, policy development, business re-engineering, and project and program management. She also has experience in project portfolio governance, including risk and quality oversight of the delivery of global change programs. Claire has formal qualifications in occupational therapy, psychology and project management. She is also a Graduate Member of the Australian Institute of Company Directors. Claire is also a member of the Finance, Investment and Products Committee and the Remuneration and Nomination Committee. Shirley McPherson is a Yamatji and Nyoongar woman from the Perth and Murchison regions of Western Australia. She has experience in program delivery and business development at the regional, national and international levels of government. Shirley is a Chartered Accountant and has held senior positions in the private, government and university sectors. She is currently a National Business Development and Engagement Manager for AFL SportsReady. Shirley has been a consultant to the mining industry in negotiating land use agreements in Western Australia and held roles as Group Manager of Indigenous Strategy and Business with Leighton Contractors Pty Ltd. She was member of the Australian Government delegation to the United Nations Permanent Forum on Indigenous Issues. Her previous board appointments included Chair of Ngarda Civil and Mining Pty Ltd (2011–13) and the Indigenous Land Corporation (2001–11), and board member of McArthur River Mining Community Benefits Trust (2009–14). Shirley is a member of the Audit, Risk and Performance Committee. Rick Allert is a Chartered Accountant with many years of experience in the corporate sector. He is a director of Genesee and Wyoming Inc. and its Australian subsidiary, Genesee and Wyoming Australia Pty Ltd; Chairman of Voyages Indigenous Tourism Australia Pty Ltd; Chairman of Kakadu Tourism (GLC) Pty Ltd and Kakadu Tourism (GCH) Pty Ltd; and Chair of AMP Superannuation Ltd and NM Superannuation Pty Ltd.
Rick’s previous appointments include chair of AXA Asia Pacific Holdings Limited, Tourism Australia, Coles Myer Ltd and Coles Group Limited, Southcorp Limited, AustralAsia Railway Corporation, Voyages Hotels and Resorts Pty Ltd, and the Aboriginal Foundation of South Australia Inc.; and Director of AMP Limited and AMP Bank Limited. Rick is the chair of the Audit, Risk and Performance Committee and a member of the Finance, Investment and Products Committee. Scott Young is a Koa man from the Winton area in Central West Queensland. He is the co-founder and Managing Director of a national specialised labour company, Young Guns Container Crew. He holds a Bachelor of Civil Engineering from the University of Southern Queensland and is a graduate of the MURRA Indigenous Business Master Class Program at the University of Melbourne. With a focus on innovation and developing the next generation of leaders, Scott is a role model for emerging leaders and start-ups and a sounding board for strategic business advice. He has won multiple awards for his commitment to leadership, including 2015 Young Business Person of the Year in the Brisbane Lord Mayor’s Business Awards. Scott is a director of First Grade Group and All Things Containers. He is a member of the Supply Chain and Logistics Association of Australia and The Executive Connection, and is a certified supplier to Supply Nation. Scott is a member of the Finance, Investment and Products Committee. Aileen Shannon is an Adnyamathanha and Yankunytjatjara woman from the Flinders Ranges and north-western pastoral areas of South Australia. Aileen began her career in the South Australian public sector in 1990, progressing to roles assisting state and federal members of parliament within the portfolios of agriculture, Aboriginal and Torres Strait Islander affairs, and foreign affairs. Aileen and her husband established their construction company, Wiltja Constructions Pty Ltd, in 2011. The company has a strong vision to create an Indigenous enterprise and is committed to generating employment opportunities across the Anangu Pitjantjatjara Yankunytjatjara Lands. The company won an award for its innovative approach to local Anangu employment in 2013. Aileen is a member of the South Australian Aboriginal Advisory Council, which provides high-level confidential advice to government ministers and senior public servants across all areas of government. Aileen is a member of the Audit, Risk and Performance Committee. Kerrynne Liddle is an Arrernte woman, born and raised in Alice Springs and now living in Adelaide. Her career in the private sector has included roles as a journalist, in public affairs, and in stakeholder and community engagement mostly in the resources industry. She ran a successful small business for more than a decade. Kerrynne has a Master of Business Administration from Adelaide University, a Bachelor of Arts (Management) from the University of SA and a Diploma from the Australian Institute of Company Directors. She is a Vincent Fairfax Fellow from the Centre for Ethical Leadership at Melbourne University. Kerrynne is a member of the Council of the University of Adelaide. She has been Chair of Tandanya National Aboriginal Cultural Institute, a member of the Council of the University of SA, and a member of the boards of the SA Housing Trust and Aboriginal Hostels Ltd and other boards across a range of sectors. In 2001, Kerrynne was awarded a Centenary Medal for services to the Australian community as a journalist. She has also been a Senate candidate. Kerrynne is a member of the Finance, Investment and Products Committee. Roy Ah-See is a Wiradjuri man who was born and raised on Nanima Reserve, near Wellington, New South Wales. He was elected to the NSW Aboriginal Land Council in 2007 and has been Chairperson of the council since 2015. He is also voting member of Gandangara Local Aboriginal Land Council. Roy has qualifications in social welfare and has worked at various government agencies and Aboriginal community controlled organisations. Roy believes land rights and connection to country are integral to the spiritual healing and cultural empowerment of Aboriginal peoples. Aboriginal and Torres Strait Islander peoples. He has served on the New South Wales Local Government and Shires Association and works in a voluntary capacity to help Aboriginal men who are experiencing challenges with drugs and alcohol. Roy is a member of the Audit, Risk and Performance Committee.